The Fun Family is a 2016, full color, original graphic novel written and drawn by cartoonist, Benjamin Frisch. 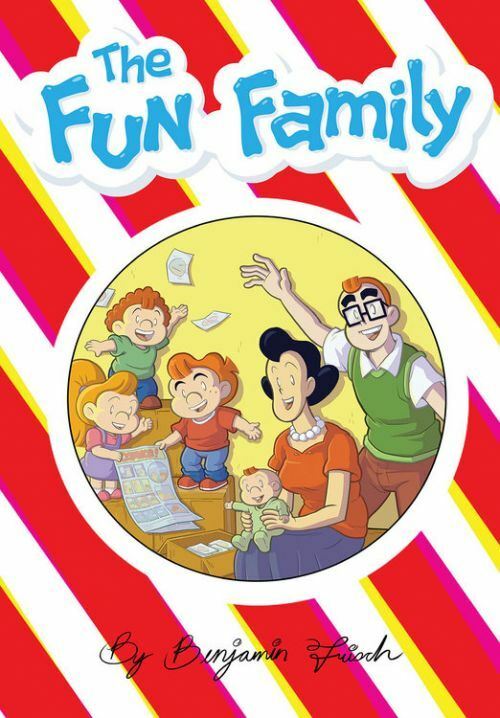 Published by Top Shelf Productions (an imprint of IDW Publishing), The Fun Family focuses on the growing dysfunction of an American family, whose head of household is a popular newspaper comic strip creator. The Fun Family introduces beloved cartoonist Robert Fun. He has earned a devoted following for his circle-shaped, newspaper comic strip, “The Fun Family.” Robert celebrates the wholesome American family by drawing inspiration from his real home life. He is married to Marsha, a devoted mother and housewife. They have four children: Robby, Molly, Mikey, and J.T. (an infant when the story starts). Unlike its comic strip equivalent, the Fun Family, however, has some dark secrets, and their idyllic world begins to collapse after two events. First, Robert's mother, Virginia (“Grandma” to the kids), dies, and then, Robert's creepy menagerie is discovered. Now, the children must rescue their family, but they will also have to escape the cycle that will have art imitating life imitating art. THE LOWDOWN: One of the most famous “circle-shaped” newspaper comic strips of all time is The Family Circus, which was created, written and drawn by the late Bil Keane. Cartoonist Benjamin Frisch uses the iconography and visual cues and themes of The Family Circus to create The Fun Family. Robert Fun even draws a comic-within-a-comic that is virtually identical in graphics, shape, format, and themes to The Family Circus. Cartoonist and comic book creator, Jessica Abel, is quoted as saying of The Fun Family, “Simply wrenching... Benjamin Frisch subverts the iconography of family cartooning, exposing the seedy underbelly of America’s obsession with the perfect family.” That is true, and The Fun Family is a blast to read. I could not stop reading it once I started. I highly recommend The Fun Family, which is still in print two years after its debut (http://www.topshelfcomix.com/catalog/the-fun-family/935). I READS YOU RECOMMENDS: Fans of original graphic novels will want this original, graphic novel, The Fun Family.